Famous Parisian restaurant Les Gourmes des Ternes opens its doors in Kightsbridge. You will find Les Gourmes des Ternes tucked-up on a quaint narrow street a few steps away from Knightsbridge station. From outside the French restaurant barely looked open, but as we were greeted at the door and shown past a ruby velvet curtain we realised the shy exterior was all part of the mystery. We arrived a little early for our table so were shown upstairs for an aperitif. 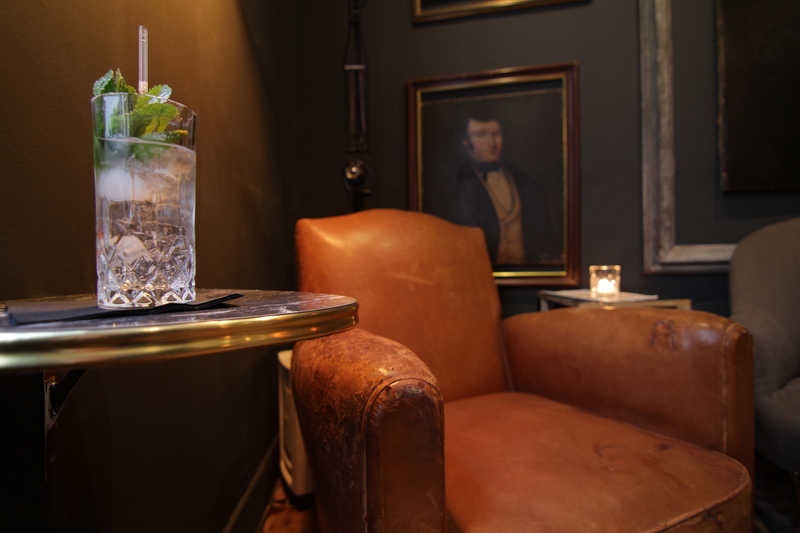 The bar was beautifully decorated with antiques meticulously collected from both France and the UK. The secret cocktail bar, fittingly named Rendez-Vous, resembled a 1920’s Parisian speakeasy. “What can I get you?” asked our bearded French bartender. I requested his favourite cocktail and accepted his invite to try Perfect Thym. I sat at the mahogany bar and sipped on my drink which was shaken with Tanqueray gin, crème d’abricot, thyme syrup, orange bitter, egg white and a squeeze of lemon, while my friend Tom admired the vintage fussball table in the corner– boys will be boys. Les Gourmes des Ternes is a product of the original which first opened in 1962 in the 8th District of Paris by Francis Marie. Passed on through generations, Les Gourmes des Ternes is now owned by grandson Maximilien Parfentieff. The Paris restaurant is a favourite among celebrities, counting the likes of Jack Nicholson and Sharon Stone as diners. We are charmingly reminded of the restaurant’s celebrity visitors with framed photographs on the wall. Even the table cloths are printed with kind messages and autographs. I ordered the Beetroot Salad which is served ‘eat as much as you like’ style chopped up in a large glass bowl with a serving spoon and side plate. Despite how much I loved the sweet dressing on the earthy root, I managed about a quarter of the bowl before giving up – I needed to save room for what was up next! As we waited for our mains, tables began to fill with French diners. We began to feel like Parisians ourselves. Two glasses of Châteauneuf-du-Pape were ready and waiting to compliment our rare Sirloin steak. Our meat was well rested, tender and of great quality. On the side, we shared crispy pomme frittes and rich peppercorn sauce – which I fought over to the very last drop. Tom ordered the signature dessert of Chocolate Mousse, which was bettered only by my choice of Crème Brûlée. At Les Gourmes des Ternes the menu is simple, but has everything you expect from a classic French brasserie. Head to the secret upstairs cocktail bar for a French Martini after a day in Hyde Park and dine late with the French.